Conveniently located in the historic Brown-Vandiviere House in picturesque downtown Canton, Georgia, Thompson, Meier & King is just steps away from the Cherokee County Justice Center and minutes from I-575. Whatever your legal needs, Thompson, Meier & King can match you with an attorney who can provide the counsel and courtroom experience necessary to fully represent your interests. Thompson, Meier & King attorneys have appeared in courts across Georgia and are experienced in the legal practice areas most likely to affect the average person including: Wills and Trusts, Real Estate, Small Business Formation and Corporate Law, Contract and other Business disputes, Family Law, Adoptions, Juvenile Law, Guardianship, Personal Injury, and General Litigation. Thompson, Meier & King also has attorneys who are experienced in Bankruptcy, Criminal Law and Mediation services. Thompson, Meier & King's attorneys are very experienced in handling diverse domestic law issues. Dana Thompson received her Bachelor of Arts degree with Honors from Randolph-Macon Woman's College in Virginia in 1983, including a year of study at the University of Reading, England. She received her Juris Doctor Degree from the University of Georgia School of Law in 1987. 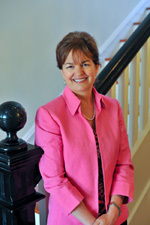 Ms. Thompson is the Managing Partner of Thompson, Meier & King, PC and has been in private practice in Canton since 1987. She served as a Law Clerk to the Hon. Braswell B. Deen, Georgia Court of Appeals, in 1986. Ms. Thompson was one of the first 100 mediators registered in the State of Georgia and is listed in Martindale-Hubbell's Bar Register of Preeminent Lawyers with an "AV" ratingits highest rating. Outside of work, Ms. Thompson is active in Fields Chapel United Methodist Church and serves on the Church's Administrative Council. She enjoys spending time with her husband and daughter; photography; travel; and hiking and fishing in the North Georgia Mountains.